I’ve been busy this summer with the kids home and I haven’t had much time to do any projects. With that being said, you’ve probably noticed a “home tips” series I’ve started where I’ve been sharing thoughts and ideas on anything home! I’m always seeking out inspiration, and I wanted to share a few of my old fun up cycled DIY’s and a few others that will help anyone decorate on a budget. 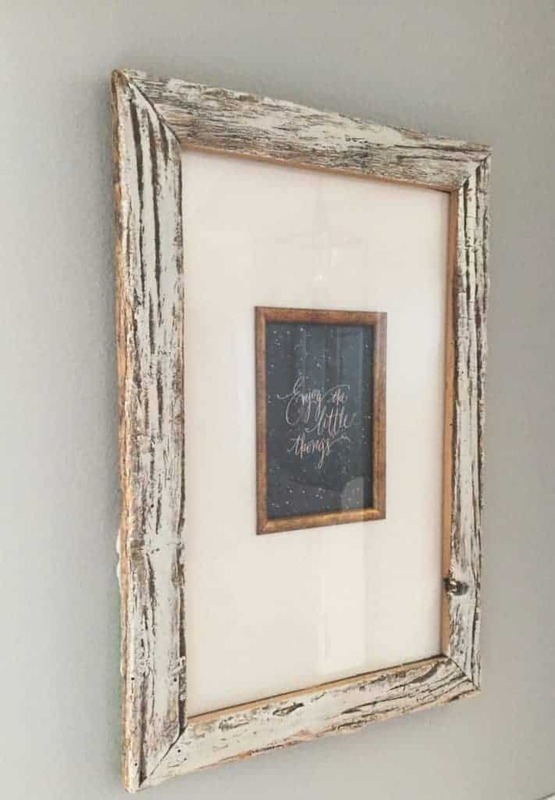 Don’t throw out any of those old picture frames that you’ve got lying around! A simple Idea to upcycle those old frames is to print out fun quotes and display them in those frames. Below is a picture frame my uncle made from wood from the family farm. It had a generic picture in it, one that didn’t really fit my style. Easy answer; change it out with a free printable you can find online! When storage shelves seem too expensive, why not make your own storage solution! I needed a budget friendly storage idea for all my sons Legos (and some of my daughters toys), so I created a cheap Lego Storage Solution. This storage table consists of a piece of plywood and three simple storage bins! Buying a vase with an interesting design on it is going to cost you significantly more than buying a plain glass one. Then you are completely free to do whatever you want with them, the possibilities are endless. 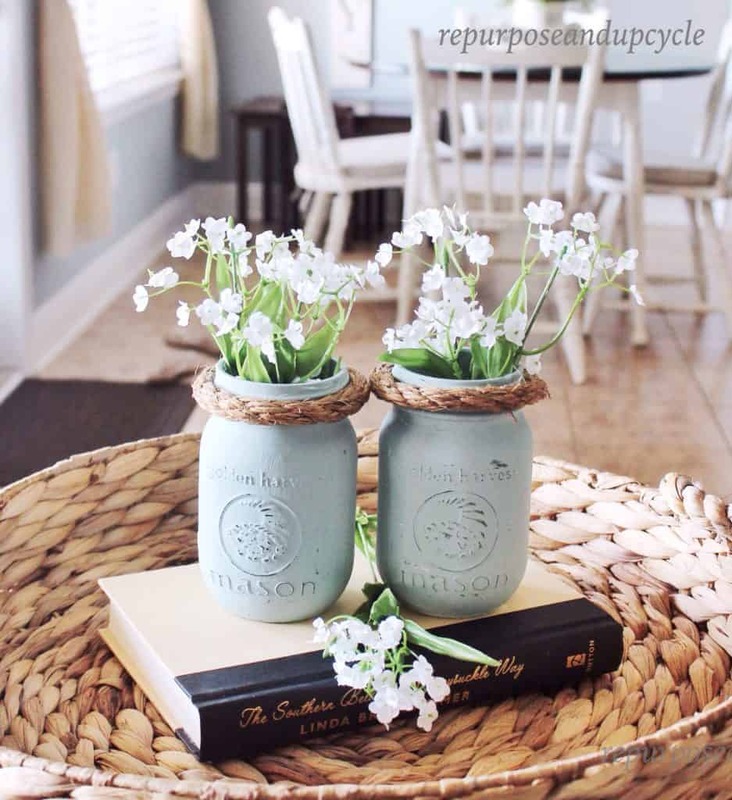 Another idea is to up cycle mason jars with a little paint! All it takes a little paint, some twine, and a few flowers and now you have a great up cycled decoration! A stylish looking headboard for the bedroom will set you back a fair few dollars but if you make your own you could save yourself a huge amount of money. 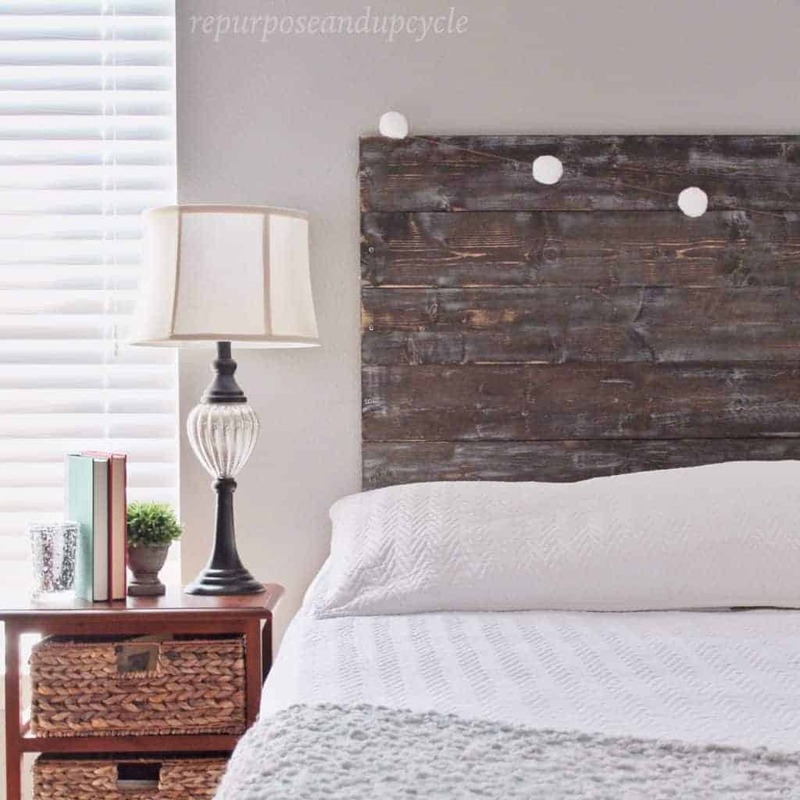 It’s easy to make a great headboard from a few pieces of salvaged wood. If you aren’t a confident painter then you might be reluctant to paint the whole room. With blackboard or chalkboard paint, you don’t need to be an expert to get it looking good. 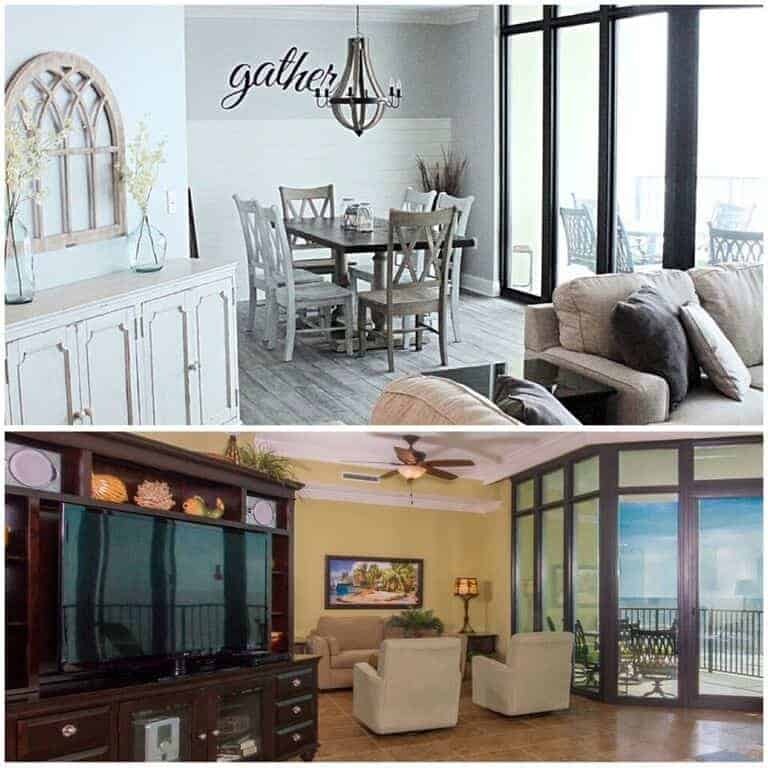 Check out this picture from Pinterest and see how the paint really transforms the space! Before you start painting, the walls will need a quick rub down with sandpaper to get rid of any lumps and bumps. Then give the wall a quick wipe down to get rid of any dust. Let them dry and then start painting. It’s a very forgiving paint and it doesn’t need to be completely smooth so it’s perfect for people that aren’t experts at DIY. Blackboard paint is a great addition to use on a single wall in the house, but don’t go overboard with it. Guests can leave you messages when they come over and if you’re so inclined, you can draw pictures and murals on the wall. That way, you can keep changing it every few weeks or so. I’m hoping this gave you a little inspiration of budget friendly up cycled DIY’s to decorate with. It’s always fun to create something out of nothing! As always, thanks for following along friends. Those jars though!! SO pretty!! 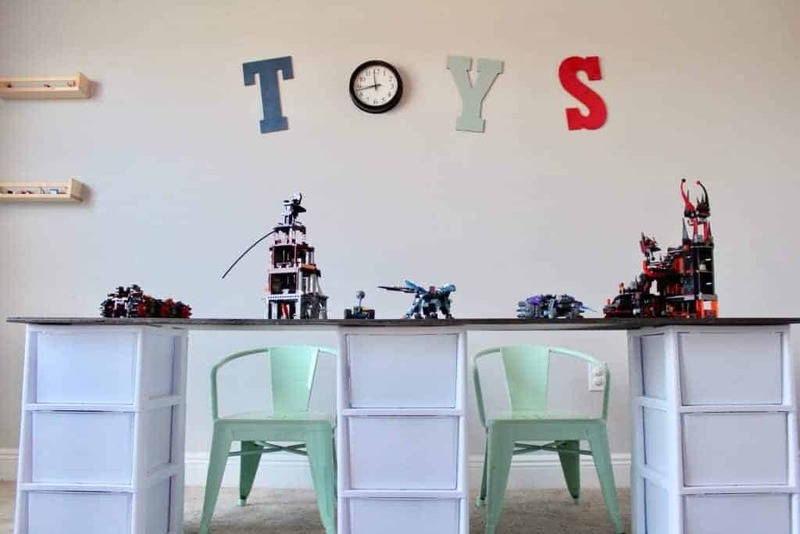 Fun chalkboard wall and the long table for toys. Visiting from Totally Terrific Tuesday party. Love these ideas. Its so great to add character and decor to your space without it having to break the bank. Thanks for sharing. You showed a nice variety of fun ideas. Some lovely ideas. I particularly like the mason jars and the headboard. Creative ideas. The ottoman from a tire sounds interesting. BTW – saw this on the Thrifty Thursday Link Party! Some great ideas! I love upcycling and repurposing! 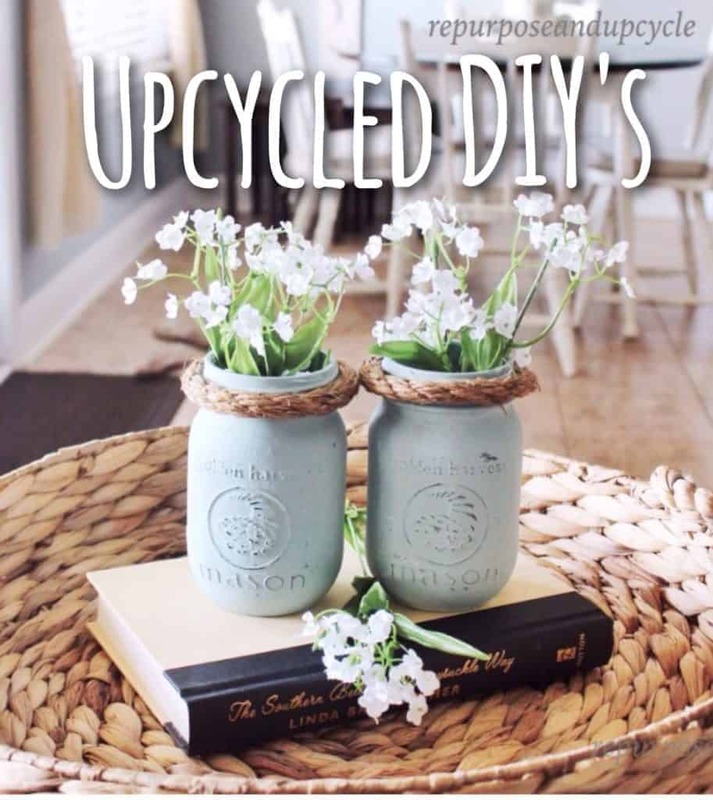 You have certainly come up with some great ideas for upcycling/recycling some everyday items! Thanks for sharing at Celebrate Your story! These are great ideas for up-cycle projects. Whenever something that might end up in the landfill can be up-cycled to become cute home decor, you have a win-win situation. Thank you for linking up at The Blogger’s Pit Stop Link Party. I’m sharing your link on social media. So many great ideas. They are all lovely! I am a big fan of upcycling myself. Awesome storage unit! So many fun projects to try out! I still love the mason jars I painted last summer – totally worth the hour or so it took to make them. Thanks so much for sharing at the #happynowlinkup! Lovely ideas. Love the jars :)Thanks for sharing at Creative Mondays last week, you are one of this weeks featured blogs. Love your ideas, especially the gutter one, and the tire ottoman, and the Ball jars….oh…all of them! How can I possibly pick just one?? All are wonderful ideas for thinking outside the box! Thank you for sharing at Sweet Inspiration! 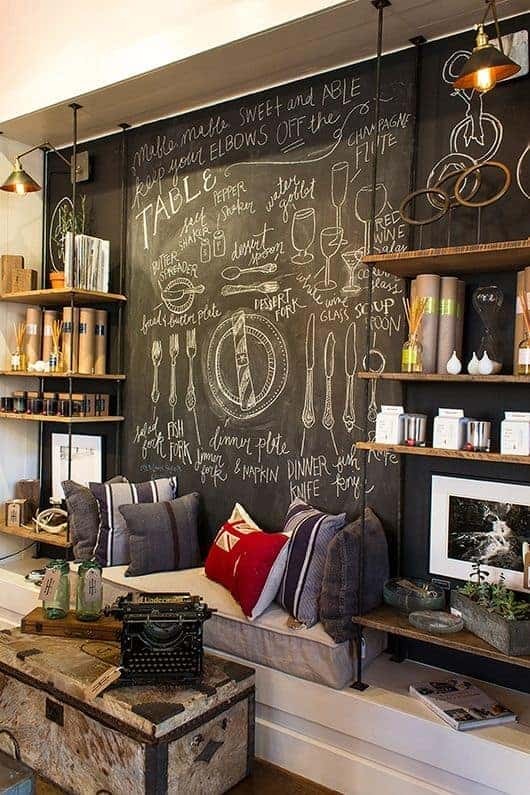 A wonderful upcycling round up Lindsey, the chalkboard wall really caught my eye. Thanks for sharing this week at Fridays Furniture Fix. thank Michelle! Hope you are doing well. Take care and have a great weekend.